An almost too simple recipe for a treat for Halloween. Lay parchment paper or a Slipmat on a baking sheet. Melt the chocolate chips and coconut oil using a double boiler or in the microwave checking to see if they are melted every 20 seconds. Dip each Oreo into the chocolate, using a fork to flip it over and make sure all sides are covered. Place cookie on the parchment paper to cool. Once you have dipped all of the Oreos, using the remaining chocolate to “decorate” the cookies. I just put a bit of the melted chocolate on my fork and kind of splatter painted the cookies. 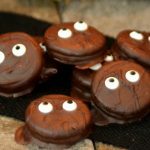 Gently press the eyeball candies into the chocolate. Store in the refrigerator until firm.